The Tuesday bird walk went to the Top Bridge Trail in Parksville. The morning started out cloudy with a cool wind, but turned sunny and warm. We saw an Orange-crowned Warbler and heard a Chipping Sparrow at the start of the walk. We heard and then had excellent views of a Cassin’s Vireo singing and feeding on a tree not far from the trail. Black-throated Gray Warblers were singing throughout the morning and one made an appearance late in the morning. The Sunday bird walk went to Moorecroft Regional Park in Nanoose Bay. The morning was sunny and warm. We saw and heard Orange-crowned Warblers, Yellow-rumped Warblers, Black-throated Gray Warblers, Townsend's Warblers, Yellow Warblers and Wilson’s Warblers throughout the morning. Yellow Warbler:: Ralph Hocken Photo. Canada Geese, Harlequin Duck, Hooded Merganser, Common Merganser, Red-breasted Merganser, Turkey Vulture, Bald Eagle, Black Oystercatcher, Mew Gull, Glaucous-winged Gull, Rufous Hummingbird, Hairy Woodpecker, Downy Woodpecker, Northern Flicker, Pileated Woodpecker, Pacific-slope Flycatcher, Northwestern Crow, Common Raven, Chestnut-backed Chickadee, Brown Creeper, Red-breasted Nuthatch, Pacific Wren, Bewick’s Wren, Golden-crowned Kinglet , Hermit Thrush, American Robin, Orange-crowned Warbler, Yellow-rumped Warbler, Black-throated Gray Warbler, Townsend's Warbler, Yellow Warbler, Wilson’s Warbler, Red-winged Blackbird, Spotted Towhee, Song Sparrow, White-crowned Sparrow, Golden-crowned Sparrow, Dark-eyed Junco, Purple Finch, Red Crossbill, Pine Siskin and American Goldfinch. Two Caspian Terns were seen on the Englishman River Estuary in Parksville. Canada Goose, Mallard, Turkey Vulture, Osprey, Red-tailed Hawk, Band-tailed Pigeon, Rufous Hummingbird, Northern Flicker, Hammond's, Flycatcher, Cassin's Vireo, Warbling Vireo, Steller's Jay, Common Raven,Violet-green Swallow, Chestnut-backed Chickadee, Bushtit, Red-breasted Nuthatch, Bewick's Wren, House Wren, Pacific Wren, Hermit Thrush, American Robin, Varied Thrush, Orange-crowned Warbler, Yellow-rumped Warbler, Black-throated Gray Warbler, Townsend's Warbler, McGillivray’s Warbler, Spotted Towhee, White-crowned Sparrow, Golden-crowned Sparrow, Dark-eyed Junco, Brown-headed Cowbird, Purple Finch, Red Crossbill and Pine Siskin were seen along the power lines along the south edge of the City of Nanaimo. Golden –crowned and Lincoln's Sparrows, Townsend's Warblers Black-throated Grey Warblers, Hermit Thrushes and a Hammond's Flycatcher were seen and heard along the Nanaimo River Road in south Nanaimo. Dark-eyed Juncos, a number of Golden-crowned Sparrows, Pileated Woodpeckers and Red-winged Blackbirds were seen along Haslam Road in south Nanaimo. One Western Tanager and four Evening Grosbeaks were seen in Cinnabar Valley in south Nanaimo. The Tuesday bird walk went to the viewing platform in Qualicum Beach and the Little Qualicum River Fish Hatchery north of Qualicum Beach. The morning started out cloudy and cool but soon turned sunny and warm. We spotted two American Dippers in the river. We saw and heard Yellow-rumped Warblers and Orange-crowned Warblers throughout the morning. We also heard and then saw a Black-throated Grey Warbler feeding high up in a deciduous tree near the trail. A Chipping Sparrow was perched and singing low in the bushes near the trail. A Red-breasted Sapsucker caught our attention as it appeared to be working on a nesting hole. He flew to a low tree not far from us and started feeding on the sap, giving us great views. As he was rhythmically tapping on the tree one could imagine him pounding out the Morse Code! Bonaparte's Gull, Mew Gull, Western Gull, Thayer's Gull, Glaucous-winged Gull, Common Murre, Belted Kingfisher, Red-breasted Sapsucker, Northern Flicker, Pileated Woodpecker, Northwestern Crow, Common Raven, Violet-green Swallow , Tree Swallow, Rough-winged Swallow, Chestnut-backed Chickadee, Brown Creeper , Pacific Wren, American Dipper, Golden-crowned Kinglet , American Robin, Varied Thrush, European Starling, Yellow-rumped Warbler, Black-throated Grey Warbler,Orange-crowned Warbler, Spotted Towhee, Chipping Sparrow, Song Sparrow, White-crowned Sparrow, Dark-eyed Junco, Red Crossbills and Pine Siskin. Over three hundred Greater White-fronted Geese and over five hundred Brant were seen flying over Tofino on the west coast of Vancouver Island. Nanoose Naturalists meet at 7 p.m. at the Nanoose Library Hall on NW Bay Road. The club looks forward to a video presentation by photographer, Eric Pittman, on Hummingbirds of Vancouver Island at our next meeting; Visitors are welcome. For more info, call Joe at 250-468-1728. The Tuesday bird walk on April 30, will be going to the Top bridge Trail in Parksville. We will meet at Parksville Bay next to the Lions Playground at 9:00 a.m. or at the parking area near Tuan Road and Industrial Way off Highway 19a at about 9:10 a.m. 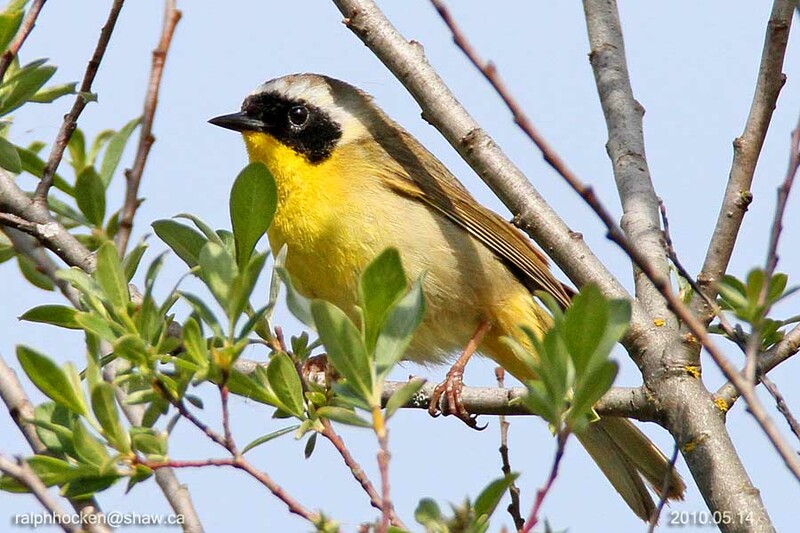 The Sunday Bird Walk on May 05, 2013, will be going to Legacy Marsh in upper Lantzville. 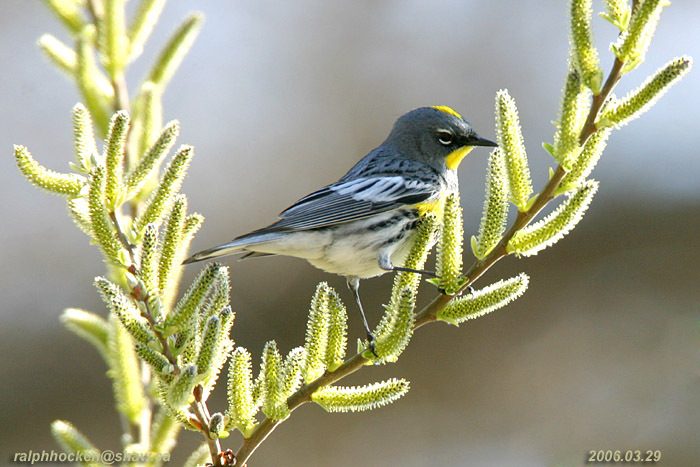 We will meet at the bird store at 9:00 a.m. or under the hydro lines along Normarel Drive Road off Superior Road in upper Lantzville at about 9:20 a.m.
Black-throated Grey Warbler: Ralph Hocken Photo. The Tuesday bird walk on April 30, 2013 will be going to the Top Bridge Trail in Parksville. The Sunday bird walk went to Nanaimo River Estuary in south in Nanaimo. The morning was windy and cloudy with a few sunny periods. We had great looks at a Lapland Longspur feeding in the tall grasses on the estuary. One Lesser Yellowlegs and twenty Greater Yellowlegs were feeding along the gravel bar on the river. A Short-eared Owl was spotted on the ground not far from us. A Northern Shrike was perched in a bush on the estuary. A flock of over sixty Greater White-fronted Geese flew high overhead heading north. 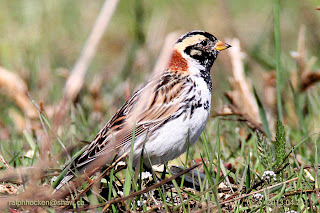 Lapland Longspur: Ralph Hocken Photo. Greater White-fronted Geese, Canada Goose, Great Blue Heron, Common Mergansers, Green-winged Teal, Greater Yellowlegs, Lesser Yellowlegs, Northern Shrike, Bald Eagle, Turkey Vulture, Short-eared Owl, Northern Harrier, Red-tailed Hawk, Glaucous-winged Gull, Northern Flicker, Common Raven, Northwestern Crow, Violet-green Swallows, Northern Rough-winged Swallows, Tree Swallows, Belted Kingfisher, American Robin, European Starling, Lapland Longspur, Spotted Towhee, White-crowned Sparrow, Savannah Sparrow, Golden-crowned Sparrow and Song Sparrow. 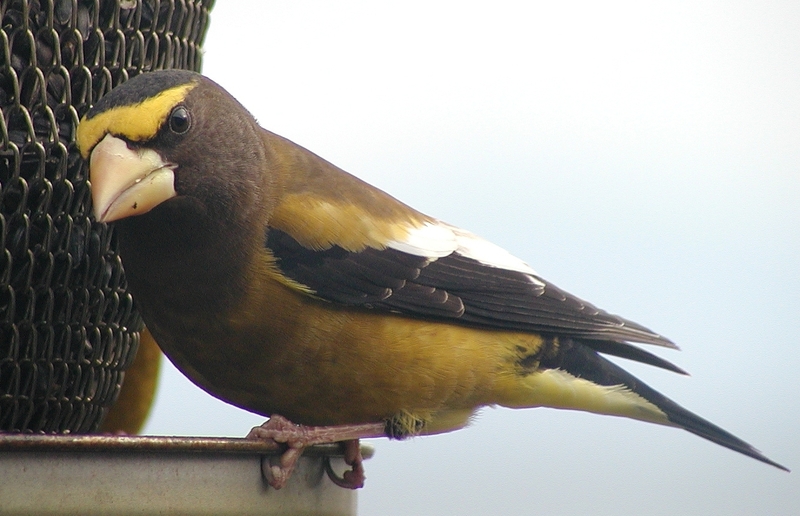 Two Evening Grosbeaks were seen along Douglas Avenue and 7th Avenue in Nanaimo. A Lapland Longspur was seen at the Nanaimo River Estuary in south Nanaimo. The Tuesday bird walk went to Springwood Park in Parksville. The morning was sunny and warm. 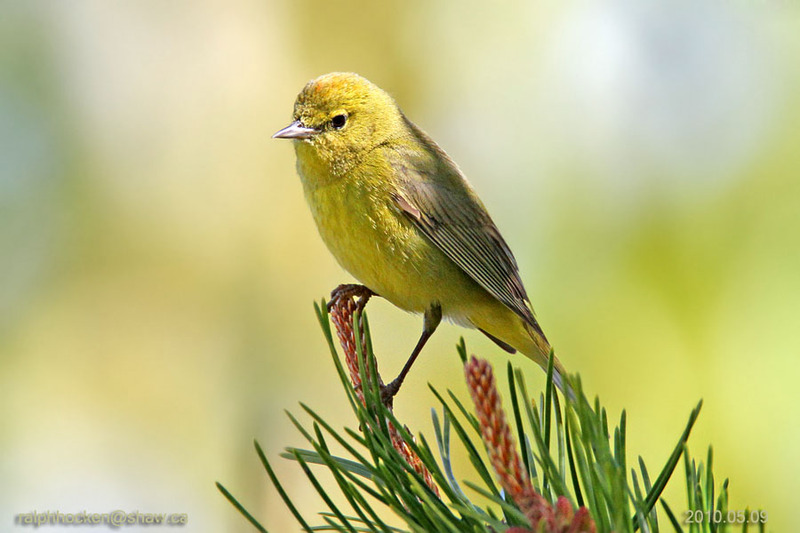 We saw and heard several Orange-crowned Warblers throughout the morning. A Common Yellowthroat entertained us from a perch on some Scotch broom next to the road giving us great views. An American Kestrel was perched in a tree along the farmer’s field. We spotted a Great Horned Owl with a fledgling as well as two pairs of Townsend's Warblers on the way back to the parking area to finish off a great morning of birding. Rufous Hummingbird, Downy Woodpecker, Northern Flicker, Pileated Woodpecker, Northwestern Crow, Common Raven, Violet-green Swallow, Chestnut-backed Chickadee, Red-breasted Nuthatch, Brown Creeper, Bewick's Wren, Pacific Wren, Golden-crowned Kinglet, American Robin, Varied Thrush, Cedar Waxwing, European Starling, Orange-crowned Warbler, Yellow-rumped Warbler, Townsend's Warbler, Common Yellowthroat, Spotted Towhee, Chipping Sparrow, Song Sparrow, Golden-crowned Sparrow, White-crowned Sparrow, Dark-eyed Junco, House Finch and Pine Siskin. 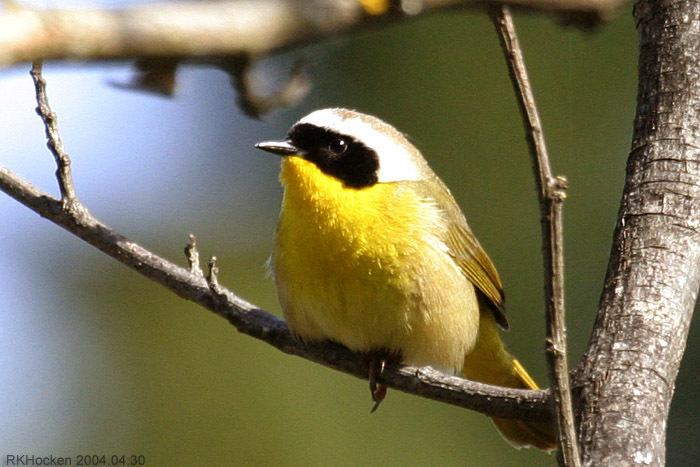 Sunday, April 14: Three Common Yellowthroats, Yellow-rumped and Orange-crowned Warblers were seen at the Nanoose Estuary in Nanoose Bay. An Osprey was seen heading south on Highway 19 coming from Harewood Mines Road in Nanaimo. Arrowsmith Naturalists - GENERAL MEETING Knox United Church, 345 Pym, Parksville, on Monday April 22 @ 7:30 p.m. The Tuesday bird walk on April 23, will be going to the Little Qualicum River Hatchery. We will meet at Parksville Bay next to the Lions Playground at 9:00 a.m. or at the viewing platform in north Qualicum Beach near Garrett Road at about 9:15 a.m. 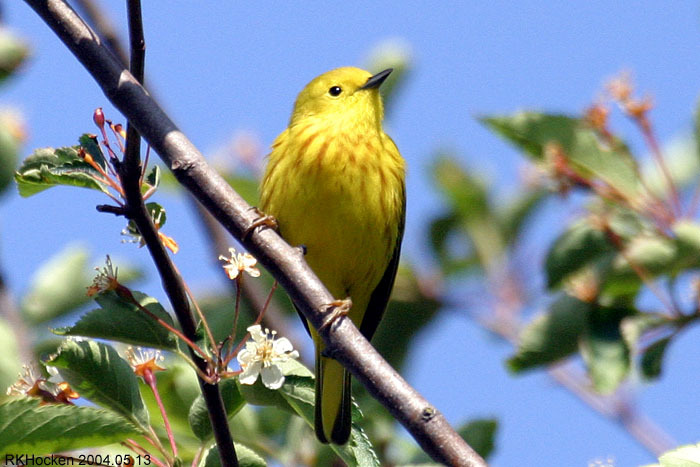 The Sunday Bird Walk on April 28, 2013, will be going to Moorecroft Regional Park in Nanoose Bay. We will meet at the bird store at 9:00 a.m. or at the parking area at Moorecroft Regional Park off Stewart Road at about 9:20 a.m.
American Kestrel: John Purves Photo. The Tuesday bird walk on April 23, will be going to the Little Qualicum River Hatchery. We will meet at Parksville Bay next to the Lions Playground or at the viewing platform in north Qualicum Beach near Garrett Road. The Sunday bird walk went to Morrell Sanctuary in Nanaimo. The morning was mostly cloudy with a few sunny periods. We watched a pair of Brown Creepers building a nest under the bark of a tree. Four Evening Grosbeaks were feeding on the Maple Tree buds giving us great views. We heard a Hutton’s Vireo and Pacific Wrens singing during the morning. Canada Goose, Mallard, Bufflehead, Turkey Vulture, Bald Eagle, Barred Owl, Band-tailed Pigeon, Anna's Hummingbird, Rufous Hummingbird, Pileated Woodpecker, Steller's Jay, Common Raven, Chestnut-backed Chickadee, Brown Creeper, Red-breasted Nuthatch, Pacific Wren, Ruby-crowned Kinglet, Golden-crowned Kinglet, American Robin, Varied Thrush, European Starling, Hutton's Vireo, Orange-crowned Warbler, Yellow-rumped Warbler, Evening Grosbeak, Spotted Towhee, Fox Sparrow, Song Sparrow, Dark-eyed Junco, Purple Finch and Pine Siskin. A Mountain Bluebird, fourteen Greater Yellowlegs, a Lesser Yellowlegs, a Western Meadowlark and a Northern Harrier were seen at the Nanaimo River Estuary in south Nanaimo. ATownsend’s Solitaire and a Wilson’s Snipe were seen on the Shelly Road side of the Englishman River in Parksville. A Chipping Sparrow was visiting a backyard feeder along Meridian Way in Parksville. Sixteen Greater Yellowlegs were seen off Macki Road in south Nanaimo. The Tuesday bird walk went to Columbia Beach and French Creek. The morning was cloudy with light rain and a strong wind off the Strait of Georgia. 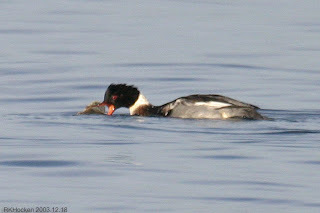 The highlights included seeing two Clark’s Grebes in with about twenty Western Grebes not far from shore. We spotted several Common Murre, two Rhinoceros Auklet, two Marbled Murrelet and a Pigeon Guillemot on the Strait. Three Yellow-rumped Warblers were feeding in a tall Alder Tree near French Creek. A Fox Sparrow put in a quick appearance at the end of the walk. Canada Goose, Brant, Eurasian Wigeon, American Wigeon, Mallard, Surf Scoter, White-winged Scoter, Bufflehead, Red-breasted Merganser, Common Merganser, Common Loon, Pacific Loon, Horned Grebe, Red-necked Grebe, Western Grebe, Clark’s Grebe, Double-crested Cormorant, Pelagic Cormorant, Brandt’s Cormorant, Great Blue Heron, Bald Eagle, Killdeer, Black Oystercatcher, Mew Gull, California Gull, Thayer's Gull, Glaucous-winged Gull, Common Murre, Rhinoceros Auklet, Marbled Murrelet, Pigeon Guillemot, Rock Pigeon, Eurasian-collared Dove, Belted Kingfisher, Anna’s Hummingbird, Downy Woodpecker, Northern Flicker, Pileated Woodpecker, Northwestern Crow, Common Raven, Chestnut-backed Chickadee, Golden-crowned Kinglet, Ruby-crowned Kinglet, American Robin, Varied Thrush, European Starling, Yellow-rumped Warbler, Red-breasted Nuthatch, Spotted Towhee, Song Sparrow, Fox Sparrow, White-crowned Sparrow, Golden-crowned Sparrow, Dark-eyed Junco , Red-winged Blackbird, House Finch , Pine Siskin and House Sparrow. A Black Headed Grosbeak was seen in a yard along Parkview Avenue in Parksville. Arrowsmith Naturalists - GENERAL MEETING Knox United Church, 345 Pym, Parksville @ 7:30 p.m. The Tuesday bird walk on April 16, 2013 will be going to Springwood Park in Parksville. We will meet at Parksville Bay at the Lion's Playground parking area in Parksville at 9:00 a.m. or at the west end of Despard Avenue, at about 9:10 a.m. The Sunday Bird Walk on April 21, 2013, will be going to Nanaimo River Estuary in south Nanaimo. 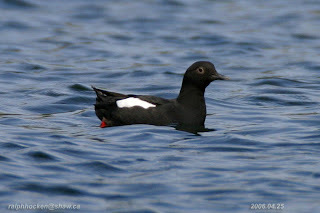 We will meet at the bird store at 9:00 a.m. or at the end of Raines Road in Nanaimo at about 9:30 A.M. The Tuesday bird walk on April 16 will be going to Springwood Park in Parksville. Townsend's Solitaire: John Purves Photo. 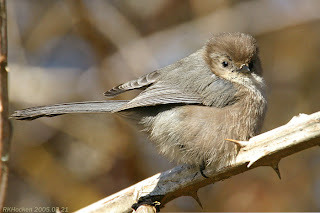 Two Townsend’s Solitaire were seen along Mariner Way in San Peril, Parksville, fly catching and perched in front of the houses, just past the mud flats. 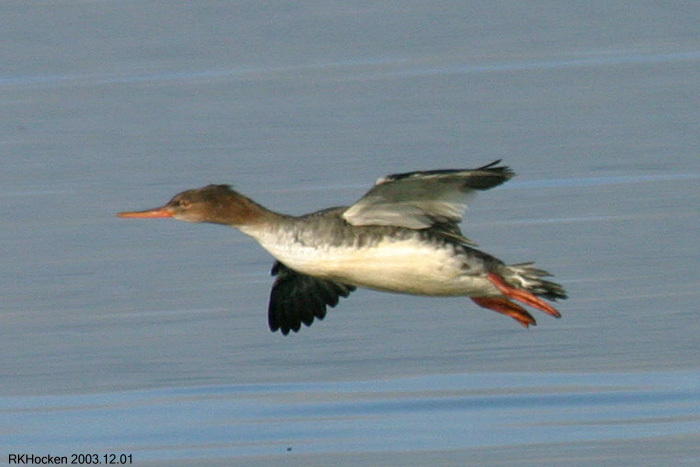 Sixty Western Grebes were seen off shore from Mariner Way. The morning was cloudy with a strong wind blowing throughout the morning. A large flock Violet-green Swallows, Tree Swallows, a Northern Rough-winged Swallow and a Barn Swallow were hawking insects just above the marsh at the start of the walk. We spotted two Bushtits busy building a nest above the trail. 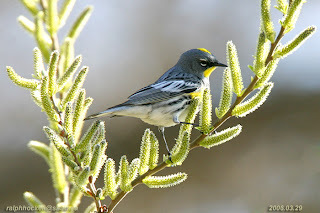 A Yellow-rumped Warbler and a Common Yellow-throat were seen near the trail. Marsh and Bewick’s Wrens were singing their songs during the morning. Canada Geese, Mallard, Wood Duck, Ring-necked Duck, Bufflehead, Hooded Merganser, Pied-billed Grebe, Turkey Vulture, Bald Eagle, Sharp-shinned Hawk, Anna's Hummingbird, Northern Flicker, Downy Woodpecker, Common Raven, Northwestern Crow, Brewer’s Blackbird, Violet-green Swallow, Tree Swallow, Northern Rough-winged Swallow, Barn Swallow, Eurasian-collared Dove, Rock Pigeon, Bushtit, Brown Creeper, Chestnut-backed Chickadee, Bewick’s Wren, Marsh Wren, Ruby-crowned Kinglet, Great Blue Heron, American Robin, Cedar Waxwing, European Starling, Yellow-rumped Warbler, Spotted Towhee, Song Sparrow, Fox Sparrow, White-crowned Sparrow, Common Yellow-throat, Golden-crowned Sparrow, Red-winged Blackbird, House Finch, Pine Siskin and House Sparrow. Three Townsend's Solitaires, a Sharp-shinned Hawk and a large number of Orange-crowned Warblers were seen along the power line right of way in the Harwood area of Nanaimo. The Tuesday bird walk went to the Shelly Road side of the Englishman River Estuary in Parksville. The morning was cloud but warm with calm winds. We heard Bewick's Wrens, Pacific Wrens, Golden-crowned Kinglets, Chestnut-backed Chickadees, Red-breasted Nuthatches, Varied Thrush, Yellow-rumped Warblers and White-crowned Sparrows singing their songs throughout the morning. A flock of Red Crossbills greeted us from high up in the tall trees. We spotted two Band-tailed Pigeons and three Yellow-rumped Warblers high up on the snags across the river. One juvenile Peregrine Falcon was perched on a snag on the estuary giving us great views through the scopes. We saw several large flocks of Brant and small flocks of Long-tailed Ducks flying up and down the Strait of Georgia. 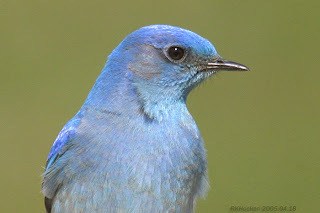 The bird of the morning showed up on the meadows--a Mountain Bluebird! The Bluebird was perched on top of a small bush, leaving once in a while to hawk insects only to return to perch and give us great views. A Northern Shrike was perched not far from the Bluebird also hunting from small bushes. The scopes provided good close up views. We spotted Orange-crowned Warblers feeding fairly high up in the trees. A Barred Owl was spotted roosting low in a cedar tree as we finished the walk. A Northern Shrike was seen in a backyard along Tamara Drive in Nanaimo. The Nanoose Naturalists look forward to a presentation by photographer, Terry Thormin on Dragonflies of Vancouver Island at our next meeting; 7 pm at the Nanoose Library Hall on NW Bay Road. Visitors are welcome. For more info, call Joe at 250-468-1728. Arrowsmith Naturalists - GENERAL MEETING - at Knox United Church, 345 Pym, Parksville @ 7:30 p.m. 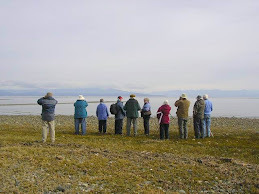 The Tuesday bird walk on April 09, 2013 will be going to Columbia Beach. We will meet at Parksville Bay at the Lion's Playground parking area in Parksville at 9:00 a.m. or at the parking area, off Admiral Tryon Blvd. and Columbia Drive , on the Oceanside of highway 19a, at about 9:10 a.m. 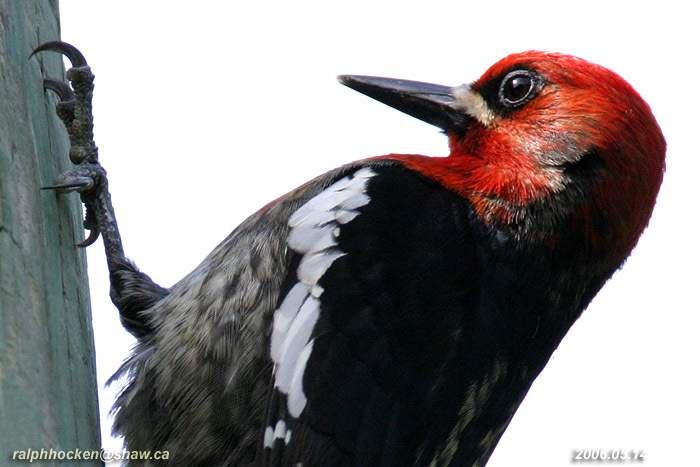 The Sunday Bird Walk on April 14, 2013, will be going to Morrell Sanctuary in Nanaimo. We will meet at the bird store at 9:00 a.m. or at the parking lot at Morrell off Nanaimo Lakes Road in Nanaimo at about 9:20 A.M.
A flock of Red Crossbills greeted us from high up in the tall trees. We spotted two Band-tailed Pigeons and three Yellow-rumped Warblers high up on the snags across the river. One juvenile Peregrine Falcon was perched on a snag on the estuary giving us great views through the scopes. We saw several large flocks of Brant and small flocks of Long-tailed Ducks flying up and down the Strait of Georgia. The bird of the morning showed up on the meadows--a Mountain Bluebird! The Bluebird was perched on top of a small bush, leaving once in a while to hawk insects only to return to perch and give us great views. A Northern Shrike was perched not far from the Bluebird also hunting from a small bushes. The scopes provided good close up views. We spotted Orange-crowned Warblers feeding fairly high up in the trees. 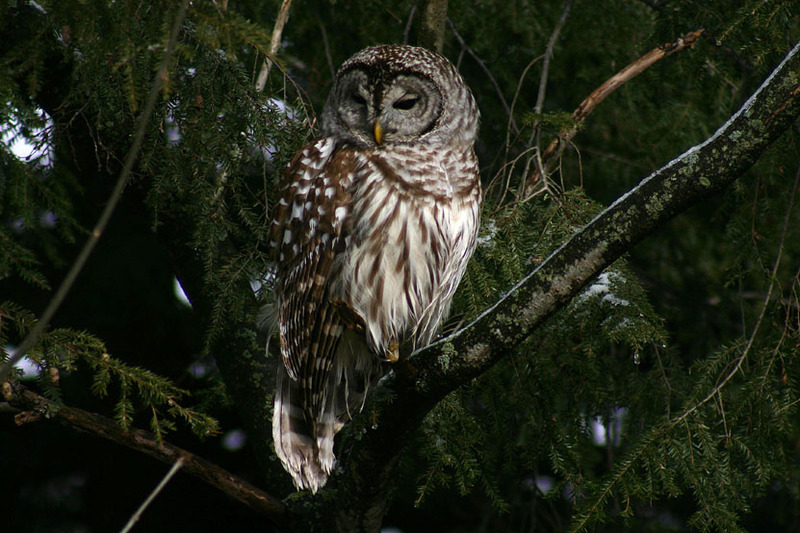 A Barred Owl was spotted roosting low in a cedar tree as we finished the walk. 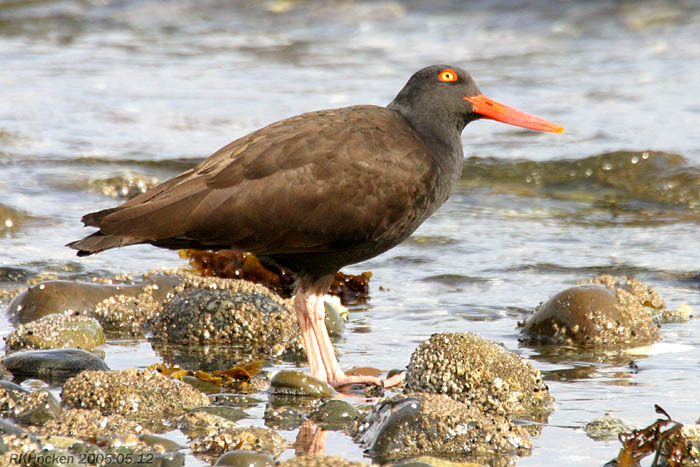 The Tuesday bird walk on April 9 will be going to Columbia Beach. Two Great Horned Owls were calling and a Northern Saw-whet Owl was calling a mate at Morell Circle in Nanaimo. Male Rufous Hummingbirds have been reported from Hammond Bay Road, Dawkins Lane, Nanaimo, Cinnabar Valley, Parksville, Qualicum Beach, and River’s Edge, Nanoose Bay. Spring is here for sure! Seventy Bald Eagles. along with a huge flock of gulls, were seen at Deep Bay. Rufous Hummingbirds, Orange-crowned Warblers, a Red-breasted Sapsucker and a Hutton's Vireo were seen along the power lines at Harewood Mines Road in Nanaimo. A large number of Savannah Sparrows, a Northern Harrier, five Greater Yellowlegs, a Eurasian Wigeon, a Northern Rough-winged Swallow was among the Tree and Violet-green Swallows and two Western Meadowlarks were seen at the Nanaimo River Estuary in south Nanaimo. The Tuesday bird walk went to the Plummer Road side of the Englishman River Estuary in Parksville. The morning was sunny and warm with calm winds off the Strait of Georgia. Large numbers of Pine Siskins were with us throughout the morning. We saw huge flocks of Red Crossbills in the forest and huge rafts of seabirds on the Strait. A Red-tailed Hawk perched close to the trail giving us great views to finish off a perfect morning of birding. A special thanks to John Purves for leading this morning’s bird walk! Canada Geese, Brant, American Wigeon, Mallard, Northern Pintail, Green-winged Teal, Greater Scaup, Surf Scoter, White-winged Scoter, Long-tailed Duck, Bufflehead, Harlequin Duck, Common Goldeneye, Barrow's Goldeneye, Red-necked Grebe, Horned Grebe, Western Grebe, Common Merganser, Red-breasted Merganser, Pacific Loon, Common Loon, Pelagic Cormorant, Common Murre, Great Blue Heron, Belted Kingfisher, Bald Eagle, Red-tailed Hawk, Black Oystercatcher, Eurasian-collared Dove, Mew Gull, California Gull, Thayer's Gull, Glaucous-winged Gull, Violet-green Swallow, Anna’s Hummingbird, Northern Flicker, Steller’s Jay, Northwestern Crow, Common Raven, Chestnut-backed Chickadee, Red-breasted Nuthatch, Pacific Wren, Ruby-crowned Kinglet, Golden-crowned Kinglet, American Robin, European Starling, Red-winged Blackbird, Spotted Towhee, Song Sparrow, Dark-eyed Junco, Purple Finch, Pine Siskins and House Finch. 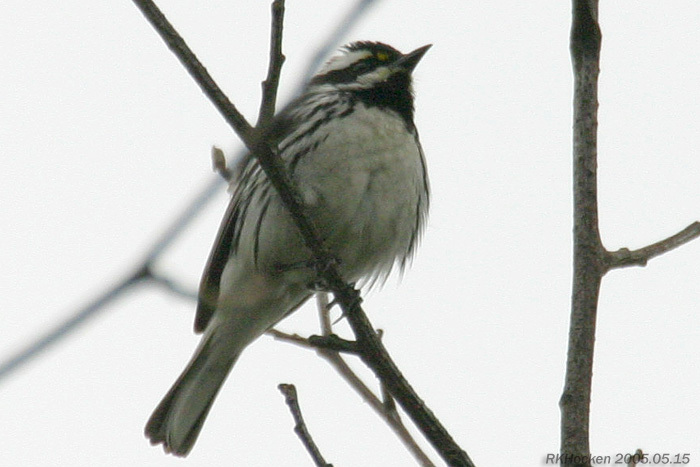 A Black-throated Gray Warbler was reported seen in a backyard in the 3400 Block of Harris Crescent at Whisky Creek. Five Western Grebes were seen on the Strait of Georgia off the breakwater at French Creek. Three Bonaparte’s Gulls were seen at Qualicum Beach. Large numbers of Violet-green Swallows were spotted flying over the river at Nanaimo River Regional Park in south Nanaimo. Nanoose Naturalists look forward to a presentation by photographer, Terry Thormin, on Dragonflies of Vancouver Island at our next meeting; 7 pm at the Nanoose Library Hall on NW Bay Road. Visitors are welcome. For more info, call Joe at 250-468-1728. 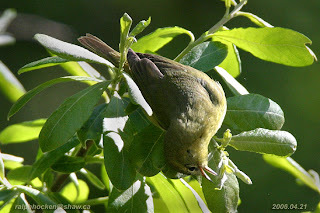 The Tuesday bird walk on April 02, 2013 will be going to the Shelly Road side of the Englishman River Estuary in Parksville. We will meet at Parksville Bay at the Lion's Playground parking area in Parksville at 9:00 a.m. or at the end of Shelly Road on the Oceanside of highway 19a, at about 9:10 a.m.